Pictured, of St.James Catholic School, Torrance, California. Pictured, Sister Mary Margaret Kreuper and Sister Lana Chang of St.James Catholic School, Torrance, California. Sister Mary Margaret Kreuper and Sister Lana Chang of St.James Catholic School caught embezzling $500K for personal use, including gambling as church declines to press charges. Southern California authorities have revealed two nuns allegedly embezzling up to $500K which was parlayed into gambling jaunts in Las Vegas. 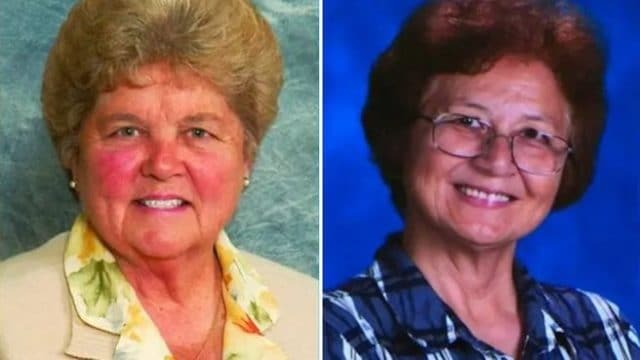 Local 10 News reported Sister Mary Margaret Kreuper and Sister Lana Chang of St.James Catholic School (both retiring earlier this year) using money from the school’s funds to live a life of luxury over the last ten years. Kreuper as the school’s principal, handled all tuition payments, with the sister depositing checks into a separate account that she and Chang had access to. The Torrance pair used the money for vacations and gambling at the casino while telling parents that the school was on a tight budget. The two ‘holy’ women were eventually caught out after a recent audit. Despite the ongoing thefts, financial statements revealed the church continuing to operate in the black as the two sisters clandestinely plowed through church funds. Sister Mary Margaret Kreuper and Sister Lana Chang: ‘We had a rich relative’. News of the ‘indiscretions’ led to the archdiocese and the church announcing they wouldn’t file criminal charges against the nuns after ‘apologizing’ for their actions. The Archdiocese appears to have now changed course- with ABC News reporting a criminal case may now be in the works following ‘deepening’ investigations. Many parents were outraged with the initial decision not to press charges, with some remarking that if the nuns were lay people, they would certainly be in jail according to the presstelegram. Other parents remarked it was well-known that Kreuper and Chang traveled often and went gambling, with the two women claiming they were gifted the trips by a rich relative. The nuns order says the woman are cooperating and intend to pay all of the money back in full.